Prime Minister Narendra Modi shakes hands with his Japanese counterpart Shinzo Abe during an agreements signing ceremony in Tokyo on Friday. (PTI Photo by Shirish Shete)After talks between Prime Minister Narendra Modi and Japanese PM Shinzo Abe, it wasn’t just the nuclear deal and strong statement on terrorism that were the highlights of the visit. 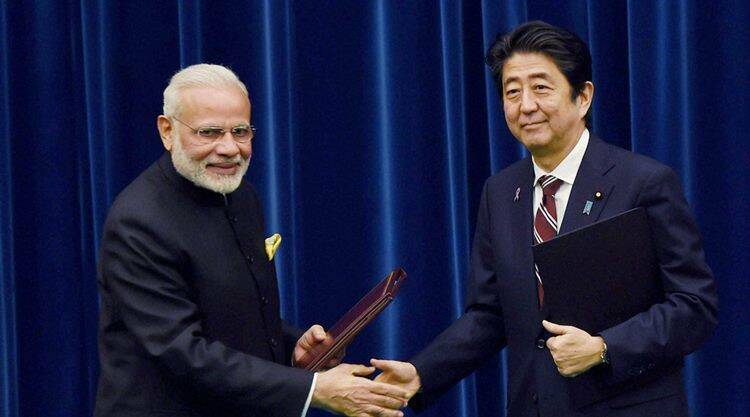 The outcomes of the visit ranged from support for India’s membership in Nuclear Suppliers’ Group, easing of Indian student visas, a clear timetable for Mumbai-Ahmedabad bullet train, an opening of Japan tourism office in India, and training of 30,000 Indians in Japanese-style manufacturing practices. Foreign secretary S Jaishankar said the Japanese side confirmed its support for India’s membership at the NSG. According to the joint statement, India decided to engage it’s “Act East Policy” with Abe’s “Free and Open Indo-Pacific Strategy” in a bid to counter Chinese President Xi Jinping’s One Belt One Road strategy. “They recognised the potential for deeper bilateral cooperation and synergy between the said policy and strategy,” the joint statement said. * Mumbai-Ahmedabad High-Speed Rail (MAHSR) Project, a flagship project between the two countries. The target schedule of the project is that the General Consultant will start its work in December 2016, that the construction work will commence by the end of 2018, and that the operation will start in 2023. * A task force will be set up comprising representatives of both countries to develop a concrete roadmap for phased transfer of technology and “Make in India.” Both sides will explore further strengthening of partnership in high-speed railways. * Preliminary work on the establishment of HSR Institute and development of its training program. The two Prime Ministers recognised the importance of accelerating the MAHSR Project by holding the Ground Breaking Ceremony in 2017. * They decided to cooperate on the human resource development in the manufacturing sector in India through “Manufacturing Skill Transfer Promotion Programme.” This programme will enhance the manufacturing base of India and contribute to “Make in India” and “Skill India,” through training 30,000 persons over next 10 years with Japanese-style manufacturing skills and practices through the establishment of the Japan-India Institutes for Manufacturing (JIM) and the Japanese Endowed Courses (JEC) in engineering colleges designated by Japanese companies in India in cooperation between the public and private sectors. The first three JIMs under the Programme would start in summer 2017 in Gujarat, Karnataka and Rajasthan. * They decided to mark the year 2017 as a year of India-Japan friendly exchanges in the field of culture and tourism. They also planned to start the Japan National Tourism Organisation (JNTO) office in Delhi by March 2016. * Abe announced a relaxation of a visa requirement for Indian students and expressed his intention to expand the number of visa application sites for Indian nationals to 20. * The two Prime Ministers recognised the importance of effective national export control systems. Japan welcomed India’s recent accession to the Missile Technology Control Regime (MTCR) and the Hague Code of Conduct against Ballistic Missile Proliferation (HCOC) and its intensified engagement with the export control regimes. The two Prime Ministers reaffirmed their commitment to work together for India to become a full member in the remaining three international export control regimes: Nuclear Suppliers Group, Wassenaar Arrangement and Australia Group, with the aim of strengthening the international non-proliferation efforts.